Enter the second floor of the Barefoot main office and you see women at their sewing machines. 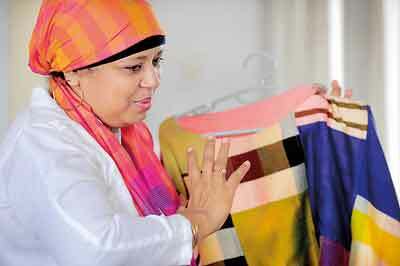 There is laughter and gossip as they produce vibrant fabric that reflects the positive nature of their enterprise. We are backstage at Barefoot, enjoying a rare glimpse into their workspace in preparation for “Barefoot- The House Collection Showcase 2017” next month. Barefoot, the brainchild of Barbara Sansoni has been in business for around 52 years and “Barefoot- The House Collection Showcase 2017” will display their signature hand-woven clothing through the work of five Barefoot designers on November 11 at the Barefoot Garden Café. “Barbara is a lovely person who never confines you to the work you are doing,” Preethi reveals. “There is a freedom in which I get to create things.” Barbara’s “Lankan way of dressing” inspired many of her most transformative pieces like her retake of the bygone “Hospital Jacket”, her fondly titled “Preethi Apron”, the “Ambalangoda Skirt” and fabulous headdresses which the audience will see at the showcase. A fond memory of how inspiration strikes is of accompanying her brother on his travels and seeing a woman dressed in a “pink hattai and lemon green saree,”sweeping the road in the 1960’s. This inspired Preethi to catch the essence of colours that work well with Sri Lankan skin tones. With 26 years of working at Barefoot, Geni Raseen’s collection is a patchwork of vibrant colours aptly titled “Psychedelic Rainbow.” Happy, playful, freeing are some adjectives we can use to describe Geni’s designs. She started at Barefoot in 1992 when she joined as a pattern maker and recalls her first lessons with Barbara who encouraged her designers to lean towards the geometric cut. Like the other designers, Geni was never restricted, making women’s, men’s, children’s clothing and miscellaneous items. The designers remark on the various body types that can easily fit into the pieces which are predominantly free flowing. “Around 20 years back I started to design a Poncho in patchwork,” Geni says showing us pieces from her collection which will be accompanied by handmade macramé jewellery. 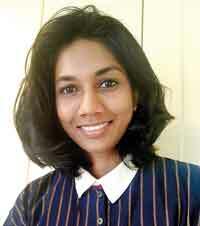 Artist and designer, some of Nelun’s work adorns the walls at the Barefoot head office and ever innovative, her largely monochrome collection is titled “Origami Dervish”, incorporating the method of paper folding in her designs, starting off with a square fabric which is folded in a myriad ways, with minor cutting and stitching. Closer inspection reveals the complexity of the design. Nelun’s collection will be accompanied by pieces from Sifani Jewellers. 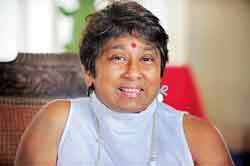 Her 25 years at Barefoot have been pivotal in Nelun’s career. Growing up “everything in my house was handloom -I however knew nothing of handloom,” she says, recalling how she was initially employed to work at the Barefoot bookshop leaving her stressful job in advertising. “Barbara has shown us to design differently,” Nelun shares pointing out that the designers are asked to use “square armholes”, “clever use of fabric cutting with a fish knife” and a stringent “no zipper” rule. This is largely due to Barefoot’s ‘waste not, want not’ policy. Nelun recalls the Barefooot’s“Maggie Nona” doll (made by Preethi’s cousin) with its purple body and green hair that became an icon of what soon became “Barefoot culture.” “Barefoot is a melting pot of the cultures of the people (Dutch, Portuguese, British settlers) who came through the Sri Lankan trade routes. Barefoot absorbed these cultures,” she says, pointing out that their products are identifiable from quite afar. 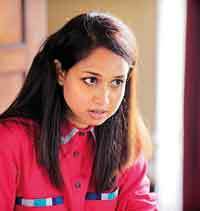 “The term Ceylonese is a hotchpotch of different cultures that ultimately makes up this beautiful Ceylonese person,” with Barefoot’s aim being to cater to this person, adds Creative Director of the Barefoot Gallery Nazreen Sansoni. 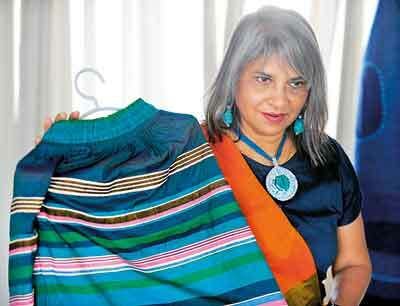 Independent designer and founder of clothing brand ‘M FACT’, Marisa Gnanaraj is no stranger to the Barefoot brigade. Her mother Marie Gnanaraj, a design director at Barefoot, allowed her young daughter to trail behind as she worked, nurturing Marisa’s creative streak. Marisa’s menswear collection ‘Horizon Infinity’ features interpretations of the vast desert landscapes. Her appreciation for her colleagues at Barefoot stems from the “love they have infused inside and outside the clothes.” Her ethos is designs that cater to the functionality of clothing allowing them to be washed and used and truly lived in. Men’s fashion in Sri Lanka Marisa terms very conservative. “I’m attempting to be more adventurous with men’s clothing and hopefully spark some creativity into mindsets,” she shares. “Shaker style” – Ravithma Gunasekera’s collection uses hues of whites, greys, blues and browns reminiscent of the simple garments of 18th century Shakers – a sect known for their minimalistic living. Ravithma who specializes in fashion and textile designing whilst also doing visual merchandising for Barefoot has her collection styled with jewellery from Sarika Amerasinghe and vivid hand-blown pieces by Arora. Corresponding with the Sunday Times via email, Ravithma states, “I like to tell stories with my designs.” Describing herself as an ‘old soul’ at heart, she enjoys the works of Shakespeare and Martin Wickramasinghe simply stating “I see full energy in those eras.” Her collection is a link between adapting those ‘energies’ and the authentic Barefoot style. She comments on her work experience at Barefoot under senior designers Preethi and Nelun, retelling the traditions created by Barbara Sansoni, as a satisfying work environment in which she has absorbed much inspiration for her own collection. Having somewhat unorthodox showcases in the past like 2003’s “Barefeet in Motion” in collaboration with the dancers of the ‘Chitrasena-Vajira Kalayatanaya’ where the dancers were in Barefoot clothing, this showcase too promises a visual feast. ‘Barefoot-The House Collection Showcase 2017’ will display their hand-woven contemporary collections on November 11 at the Barefoot Garden Café. The event will continue with a pop up sale at the end of the showcase where customers can purchase the collections (sizes for all body types freely available). Limited tickets priced at Rs. 2500 will be available from October 24 at all Barefoot Stores (Bambalapitiya, Dutch Hospital,Colombo and the Galle Fort shop in Galle). For ticket inquiries contact 0112 505 559.